Taking kids into the great outdoors is a great way to get them moving getting not only fresh air but terrific exercise as well. Camping can involve lots of activities that are naturally active so kids get fit while they are having fun, making it an ideal holiday choice for families. 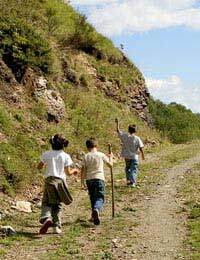 Most camping trips involve lots of the active play that kids naturally enjoy. Parents can guide their children on nature walks, looking for specific plants and animals along the way. While no specific gear is required beyond sun and bug protection, kids may get a kick out of buying decorated walking sticks or finding a good sized branch and decorating it themselves. Older kids might enjoy climbing, making the workouts a bit more challenging. Simple climbs over rugged terrain require only long pants, sturdy boots, and sunscreen with an appropriate level of protection. More advanced climbs may require safety equipment such as ropes and harnesses. Boating is also enjoyable for families, and when rowboats are chosen over motorboats, family members can build muscle and get a good aerobic workout, too. Finally, biking is an activity that is great for all but the youngest family members. Getting away from paved city streets can make bike riding more interesting, giving kids up-close looks at all that nature has to offer. Many campgrounds offer rentals of boats and all-terrain bikes. Campground or Really Roughing It? The best way to enjoy camping with the family is to make sure that there are enough activities for every age group. Kids tend to get bored easily and as any experienced parent will tell you, there are few things more difficult to deal with than a bored child. While adults may prefer the notion of a tent pitched in the middle of nowhere with only the sounds of nature, kids may have more fun at a family campground. Most campgrounds offer a number of activities for kids such as swimming pools, playground equipment, and for older kids, even a small arcade. Unless parents are experienced campers and can find ways to keep the kids entertained on their own, a family campground may be the best choice, at least for the first few times. Gathering around a roaring fire is one of the highlights of any camping trip, especially when great food is cooking. Most kids are happy to eat a supper that they’ve helped to prepare, so spending an afternoon fishing is sure to help kids be enthusiastic about their evening meal. And after an active day of hiking, climbing, boating, and biking, there is plenty of room in the diet for a sweet treat. Toasted marshmallows, anyone?